Saint-Gobain tillverkar och säljer ljudabsorberande undertak och väggabsorbenter. Access akustiktak är glasullsbaserade, ljudabsorberande och från två håll nedfällbara luckelement. Erhålls med kant A, C och Frieze med Akutex FT-ytskikt. För korridorer och installationsstråk där total åtkomst av mellantaksutrymmet eftertraktas. Advantage akustiktak är glasullsbaserat och ljudabsorberande, för enklare applikationer. Finns med kant A eller E för synligt bärverk. Uppfyller baskraven avseende akustik och fuktbeständighet. Combison akustiktak är glasullsbaserat, ljudisolerande och ljudabsorberande med Akutex FT ytskikt. Finns med kant Uno A, Uno Ds, Duo A eller Duo E. För dolt eller synligt bärverk. Focus akustiktak är glasullsbaserat och ljudabsorberande med Akutex FT ytskikt. Finns med kant A, B, Dg, Ds, E, Ez, F eller Lp. För dolt eller synligt bärverk alt. diktmontage. 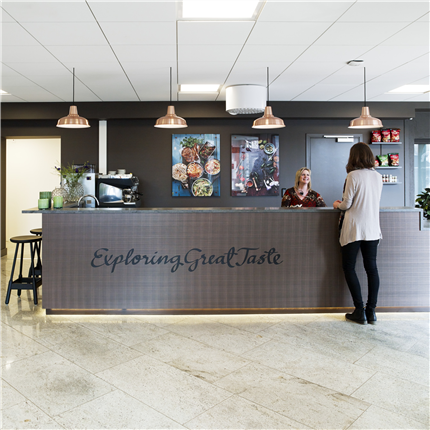 För t ex kontor, receptioner, allmänutrymmen. Akusto väggabsorbenter och kontorsskärmar är glasullsbaserade och ljudabsorberande samt finns i ett flertal olika ytskikt, kulörer och inramningar. Kant A och C.
Produkterna består av glasull som baseras på mer än 70% returglas samt växtbaserat bindemedel. Förutom högklassiga akustiksystem erbjuder vi specialistkunskap och rådgivning för att säkerställa en bra ljudmiljö, med fokus på skola, vård och kontor. Resultatet är miljövänliga lösningar som sänker ljudnivån, minskar ljudutbredningen och förbättrar taluppfattbarheten. På så vis vill vi bidra till att människor mår och fungerar bra inomhus. For applications where a robust suspended ceiling system is required. Ecophon Focus A has an exposed grid system. Each tile is easily demountable. The systems consist of Ecophon Focus A tiles and Ecophon Connect grid systems, with an approximate weight of 3 kg/m². The tiles are manufactured from high density, 3rd generation glass wool. The visible surface has an Akutex™ FT coating and the back of the tile is covered with glass tissue. The edges are primed. The grid is manufactured from galvanized steel. Ecophon Hygiene Foodtec A C3 is a wall to wall, sound-absorbing ceiling system intended for environments where there is risk for contaminations, and where frequent cleaning is required. This system is recommended where humidity levels are occasionally high. 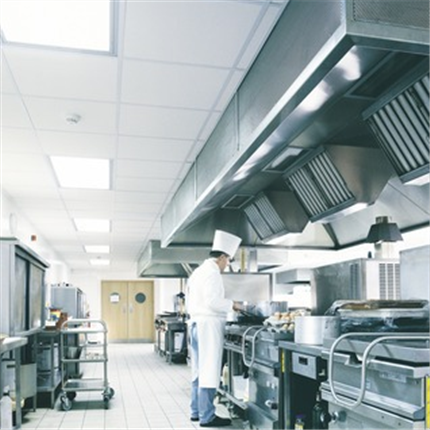 Examples of applications: the food and beverage industries, restaurants and catering kitchens. 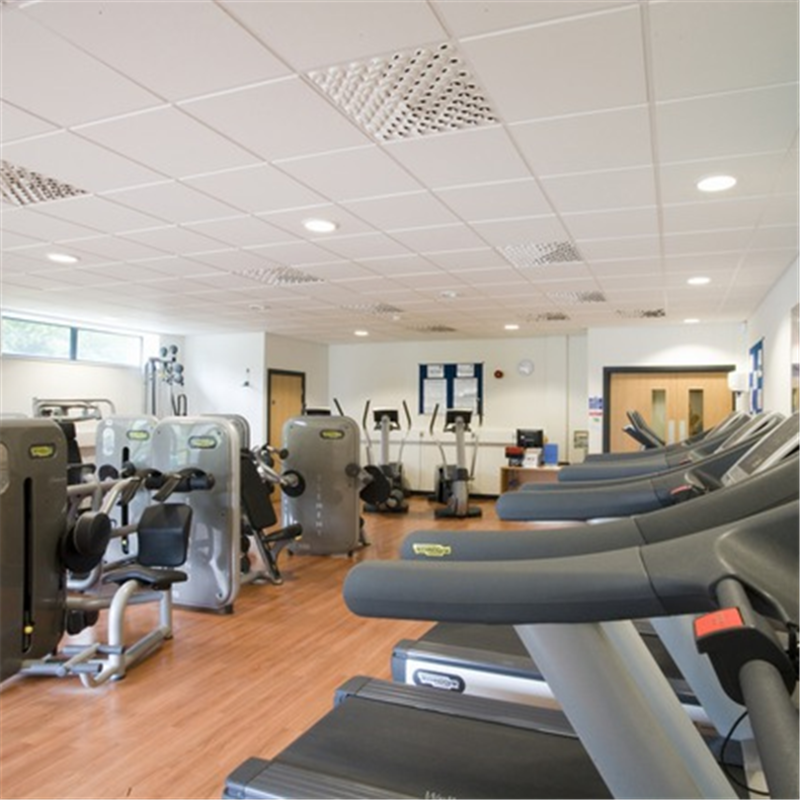 The system consists of Ecophon Hygiene Foodtec A tiles, which have a core of high density, 3rd generation glass wool and a painted stain protected Akutex HS surface. The back and the edges are painted. The tile is designed to be demounted and cleaned on a regular basis. The supporting structure is a corrosion protected exposed Connect T24 C3 grid of specially treated steel with a high corrosion resistance. The weight of the system is approximately 3,5 kg/m2 (20 mm) and 5 kg/m2 (40 mm). The tiles should be secured to the grid with Connect Hygiene clips in order to withstand pressure during cleaning and to minimise. For applications requiring a dark ceiling having low light reflection and good sound absorbing properties. Ecophon Sombra A has an exposed grid system. Each tile is easily demountable. The system consists of Ecophon Sombra A tiles and Ecophon Connect grid systems, with an approximate weight of 3 kg/m² (4 kg/m² with Ecophon Extra Bass). The tiles are manufactured from high density, 3rd generation glass wool. The visible surface is a matt black batch painted glass tissue and the back of the tile is covered with glass tissue. The edges are natural. 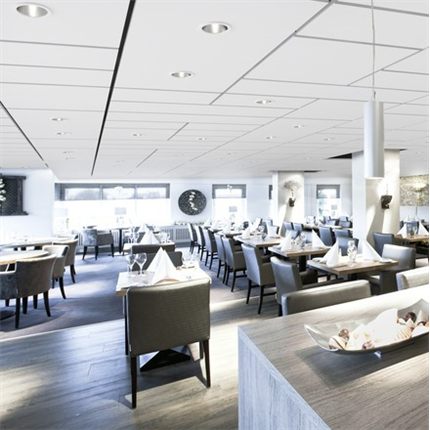 To improve absorption in the low frequency range, Ecophon Extra Bass can be installed on top of the suspended ceiling. For best performance and system quality, use Ecophon´s matt black Connect grid and accessories. The grid is manufactured from galvanized steel. For applications where a suspended ceiling with a concealed grid is required, but individual tiles must be easily demountable. 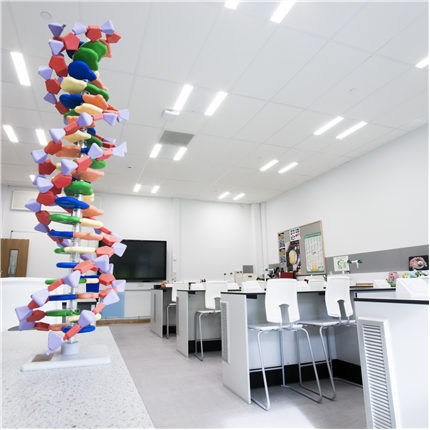 Ecophon Focus Ds has a concealed grid and symmetrical edge design, allowing easier assembly, integration of light fittings and ventilation. The ceiling has an even appearance, with the bevelled edges forming a discreet groove between the tiles. The tiles are easily demountable. The systems consist of Ecophon Focus Ds tiles and Ecophon Connect grid systems, with an approximate weight of 3-4 kg/m². The tiles are manufactured from high density, 3rd generation glass wool. The visible surface has an Akutex™ FT coating and the back of the tile is covered with glass tissue. The edges are painted. For best performance and system quality, use Ecophon Connect grid and accessories. The grid is manufactured from galvanized steel. The system is patented. 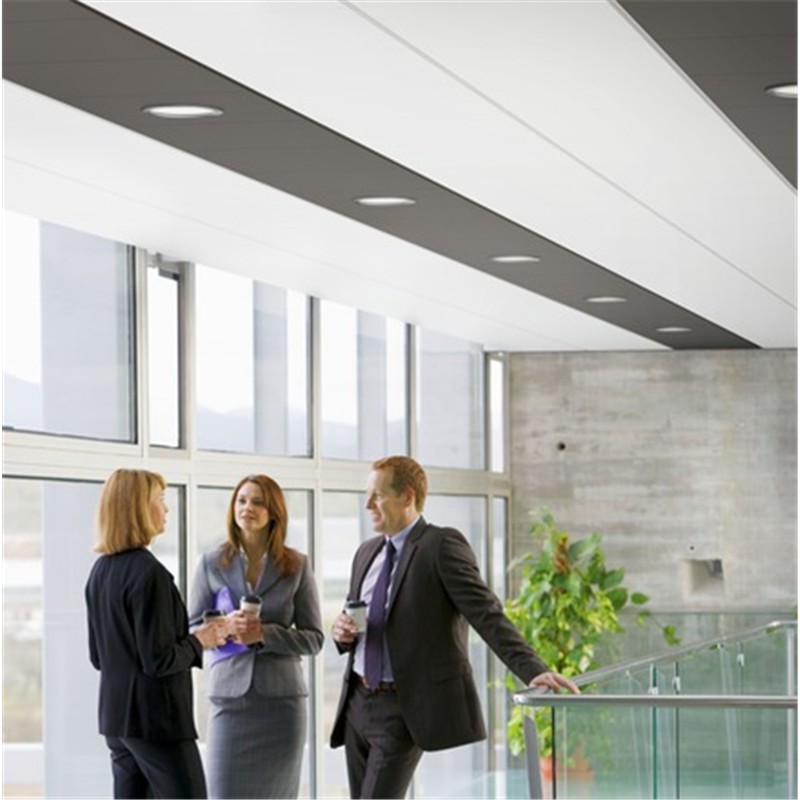 Suitable for open plan offices or other premises where strict demands are made on good acoustics and speech intelligibility, and where demountability is vital. Ecophon Master A has an exposed grid system. Each tile is easily demountable. The system consists of Ecophon Master A tiles and Ecophon Connect grid systems, with an approximate weight of 5 kg/m². The tiles are manufactured from high density, 3rd generation glass wool. The visible surface has an Akutex FT coating and the back of the tile is covered with glass tissue. The edges are primed. For best performance and system quality, use Ecophon Connect grid and accessories. The grid is manufactured from galvanized steel. 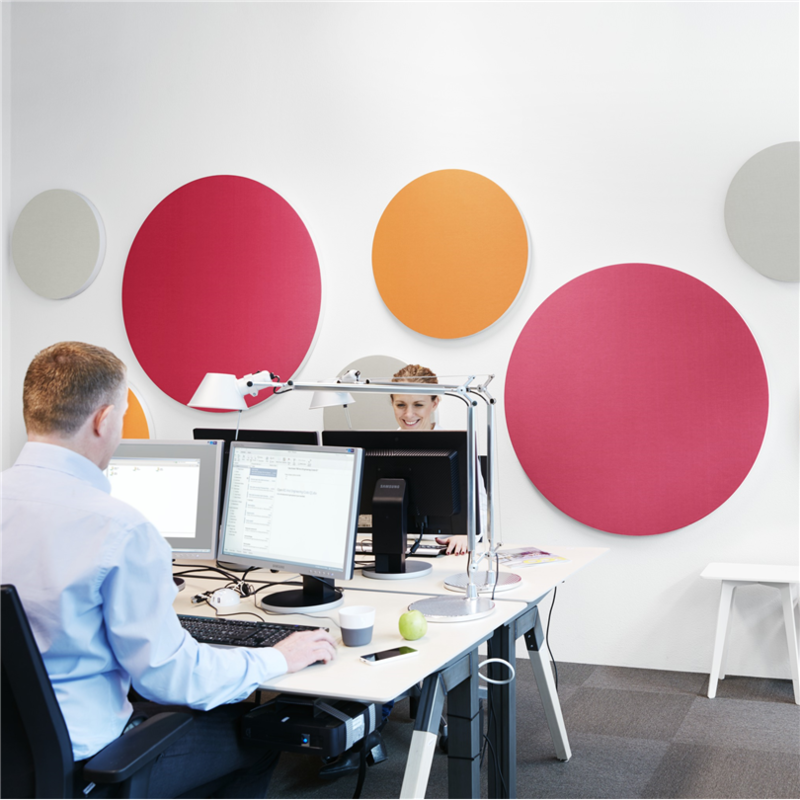 Suitable for open plan offices or other premises where strict demands are made on good acoustics and speech intelligibility. Ecophon Master E has a recessed visible grid and a tegular edge design, creating a ceiling with a shadow effect that accentuates each tile and partially conceals the grid system. The visible surface of each tile is 10 mm below the grid. Each tile is easily demountable. The system consists of Ecophon Master E tiles and Ecophon Connect grid systems, with an approximate weight of 5 kg/m². The tiles are manufactured from high density, 3rd generation glass wool. The visible surface has an Akutex FT coating and the back of the tile is covered with glass tissue. The edges are painted. For best performance and system quality, use Ecophon Connect grid and accessories. The grid is manufactured from galvanized steel. Suitable for open plan offices or other premises where strict demands are made on good acoustics and speech intelligibility. 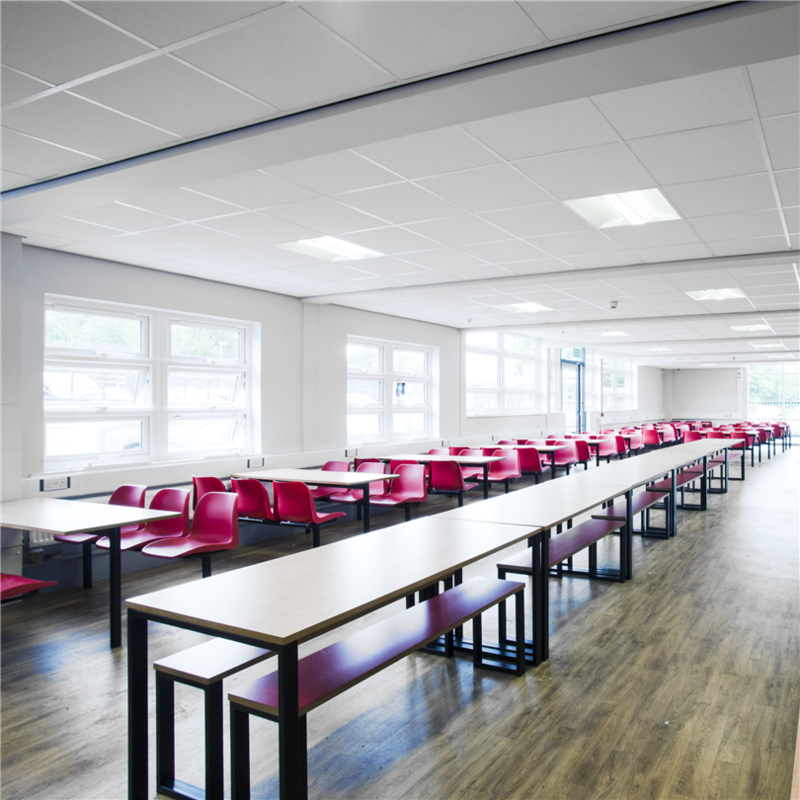 For applications where a suspended ceiling with a concealed grid is required, but individual tiles must be easily demountable. Ecophon Master Ds has a concealed grid and symmetrical edge design, allowing easier assembly, integration of light fittings and ventilation. The ceiling has an even appearance, with the bevelled edges forming a discreet groove between the tiles. The tiles are easily demountable. The systems consist of Ecophon Master Ds tiles and Ecophon Connect grid systems, with an approximate weight of 6 kg/m². The tiles are manufactured from high density, 3rd generation glass wool. The visible surface has an Akutex FT coating and the back of the tile is covered with glass tissue. The edges are painted. For best performance and system quality, use Ecophon Connect grid and accessories. The grid is manufactured from galvanized steel. The system is patented. 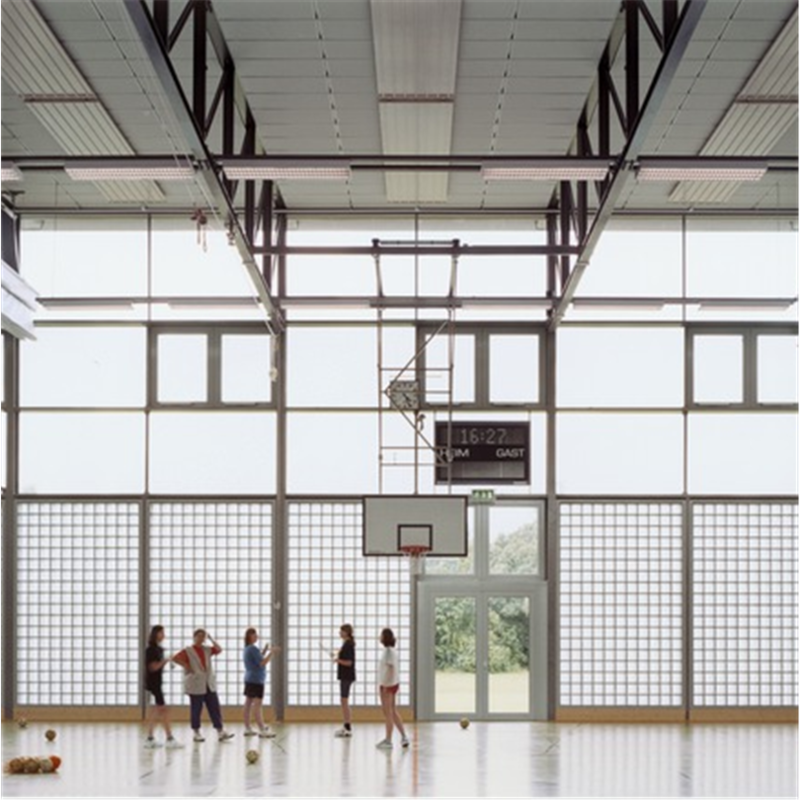 For ceilings in sports halls or similar where there is risk of high mechanical impact. Ecophon Super G Plus A has a robust grid system consisting of recessed profiles mounted directly to the soffit or on a suspended sub-grid. The tiles are not demountable. The systems consist of Ecophon Super G Plus A tiles and Ecophon Connect grid systems, with an approximate weight of 6 kg/m² for direct installation and 10 kg/m² for suspended installation. The tiles are manufactured from high density, 3rd generation glass wool. The visible surface is a strong glass fibre fabric and the back of the tile is covered with glass tissue. The edges are primed. For best performance and system quality, use Ecophon Connect grid and accessories. The grid is manufactured from galvanized steel. For applications where an attractive suspended ceiling is required and easy removal of individual tiles is essential. Ecophon Focus E has a recessed visible grid and a tegular edge design, creating a ceiling with a shadow effect that accentuates each tile and partially conceals the grid system. The visible surface of each tile is 10 mm below the grid. Each tile is easily demountable. The systems consist of Ecophon Focus E tiles and Ecophon Connect grid systems, with an approximate weight of 3 kg/m². The tiles are manufactured from high density, 3rd generation glass wool. The visible surface has an Akutex™ FT coating and the back of the tile is covered with glass tissue. The edges are painted. For best performance and system quality, use Ecophon Connect grid and accessories. The grid is manufactured from galvanized steel. For applications where a unique demountable suspended ceiling is required. The edge design of the system conceals the support edges of the tile and creates a distinctive floating appearance. The suspension grid is approximately 14 mm above the visible surface of the tile, which gives the impression that each tile is individually suspended. The tiles are easily demountable even in areas where there is a very small overall depth of system. The systems consist of Ecophon Focus Dg tiles and Ecophon Connect grid systems, with an approximate weight of 3-4 kg/m². The tiles are manufactured from high density, 3rd generation glass wool. The visible surface has an Akutex™ FT coating and the back of the tile is covered with glass tissue. The edges are painted. For best performance and system quality, use Ecophon Connect grid and accessories. The grid is manufactured from galvanized steel. 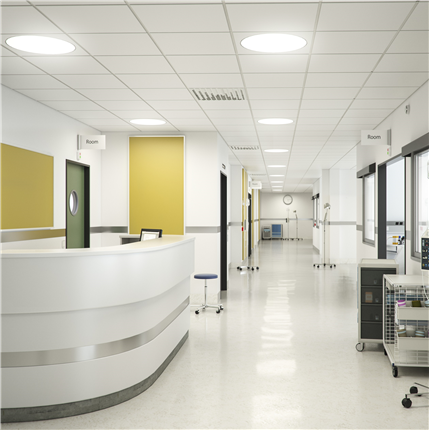 Ecophon Focus Lp has a semi-concealed grid system and is used for highlighting direction in a room. There is a wide gap between the tiles in the emphasized direction and narrow gap in the other. The edges are sharp and well defined. The system consists of standard Focus Lp tiles in 600 or 300 mm width and Focus Lp Technical tiles in widths of 150, 300 or 600 mm. The tiles are manufactured from high density, 3rd generation glass wool. The visible surface has an Akutex™ FT coating and the back of the tile is covered with glass tissue. The edges are painted. The Technical tiles are used to create areas for technical installations such as luminaires, ventilation, sprinklers, smoke detectors, loudspeakers etc. The exact width (148, 298 or 598 mm) is adopted to suit the standard sizes of luminaires on the market. The tiles and Connect grid systems give an approximate weight of 3-4 kg/m2 for the system. The grid is manufactured from galvanized steel. For best performance and system quality, use Ecophon Connect grid and accessories. 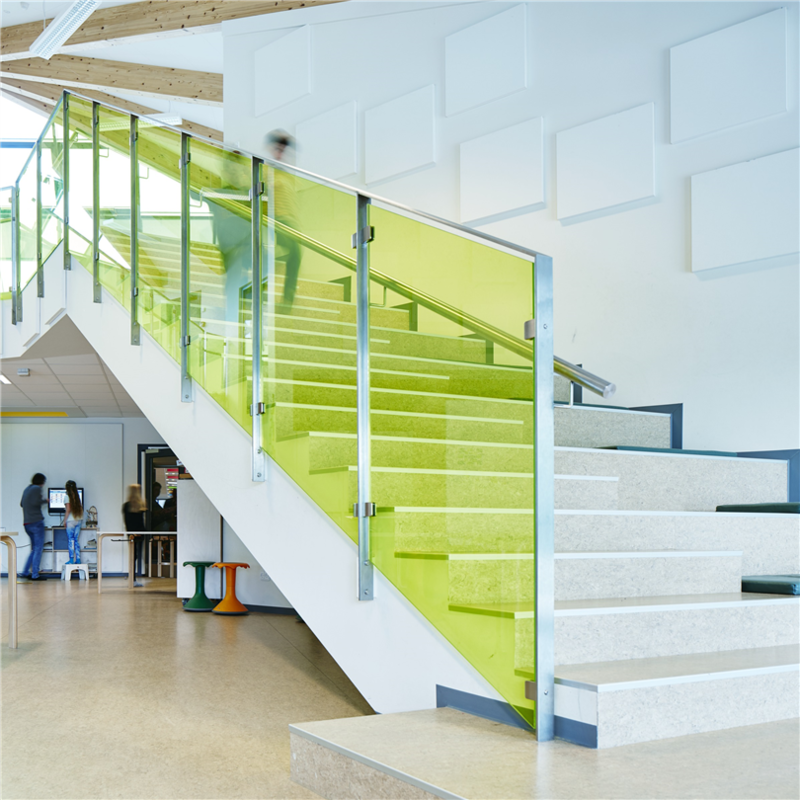 Suitable for classrooms or other premises where strict demands are made on good acoustics and speech intelligibility, and where demountability is vital. Ecophon Master Rigid A has an exposed grid system. Each tile is secured in the grid by clips (patent pending) , but fully demountable. The system consists of Ecophon Master Rigid A tiles, Ecophon Extra Bass and Ecophon Connect grid system, with an approximate weight of 3,5 kg/m². The tiles are manufactured from high density, 3rd generation glass wool. The surface is a reinforced sandwich construction. The visible surface has an Akutex™ FT coating. The product is also available with a sound reflecting surface (gamma) with the same visual appearance. The back of the tile is covered with glass tissue. The edges are primed. 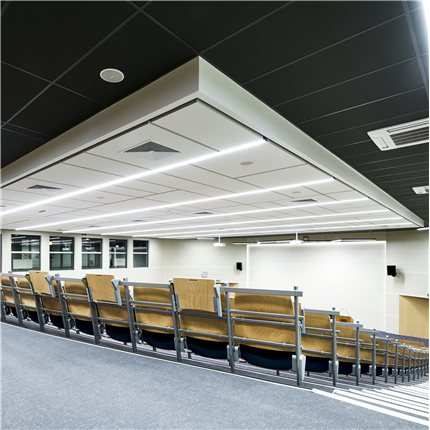 Ecophon Extra Bass is used to improve sound absorption in the low frequency range, and is installed on top of the suspended ceiling. For best performance and system quality, use Ecophon Connect grid and accessories. The grid is manufactured from galvanized steel. Suitable for classrooms or other premises where strict demands are made on good acoustics and speech intelligibility, and where demountability is required. Ecophon Master Rigid Dp (patent pending) has a semi-concealed grid system, and is used when an impact resistant and lockable system is required. There is a 8 mm gap between the tiles in the emphasized direction and narrow gap in the other. The edges are sharp and well defined. Each tile can be locked but still fully demountable. The system consists of Ecophon Master Rigid Dp tiles, Ecophon Extra Bass and Ecophon Connect grid system, with an approximate weight of 4 kg/m². The tiles are manufactured from high density, 3rd generation glass wool. The surface is a reinforced sandwich construction. The visible surface has an Akutex™ FT coating. The product is also available with a sound reflecting surface (gamma) with the same visual appearance. The back of the tile is covered with glass tissue. The edges are painted. 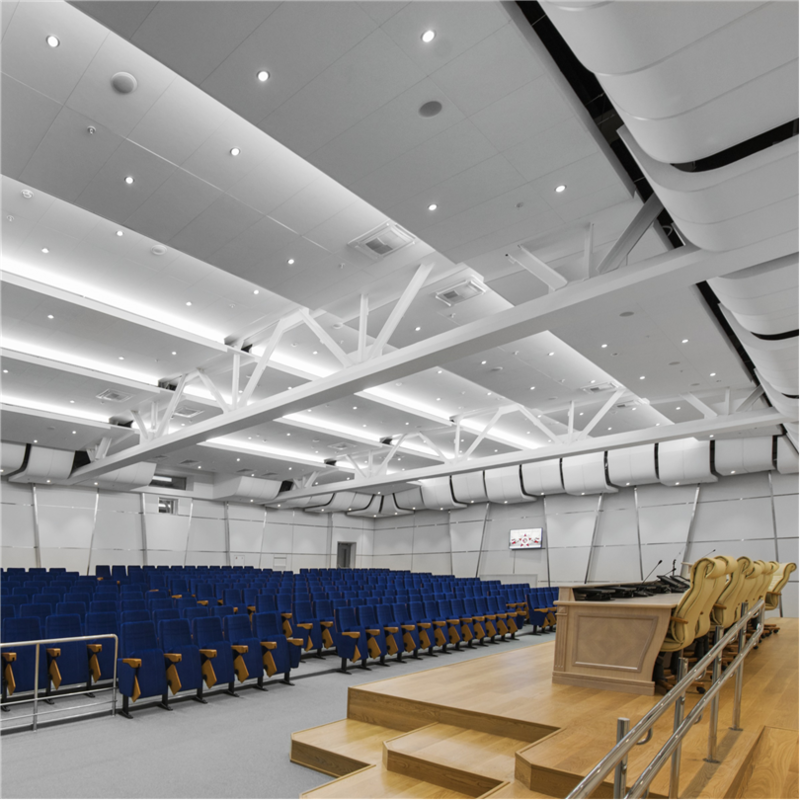 Ecophon Extra Bass is used to improve sound absorption in the low frequency range, and is installed on top of the suspended ceiling. For best performance and system quality, use Ecophon Connect grid and accessories. The grid is manufactured from galvanized steel. Suitable for classrooms or other premises where strict demands are made on good acoustics and speech intelligibility, and where demountability is vital. Ecophon Master Rigid E has a recessed visible grid and a tegular edge design, creating a ceiling with a shadow effect that accentuates each tile and partially conceales the grid system. The visible surface of each tile is 10 mm below the grid. Each tile is secured in the grid by clips (patent pending), but fully demountable. The system consists of Ecophon Master Rigid E tiles, Ecophon Extra Bass and Ecophon Connect grid system, with an approximate weight of 3,5 kg/m². The tiles are manufactured from high density, 3rd generation glass wool. The surface is a reinforced sandwich construction. The visible surface has an Akutex™ FT coating. The product is also available with a sound reflecting surface (gamma) with the same visual appearance. The back of the tile is covered with glass tissue. The edges are painted. 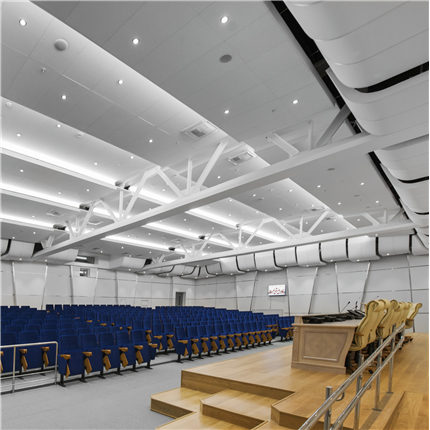 Ecophon Extra Bass is used to improve sound absorption in the low frequency range, and is installed on top of the suspended ceiling. For best performance and system quality, use Ecophon Connect grid and accessories. The grid is manufactured from galvanized steel. 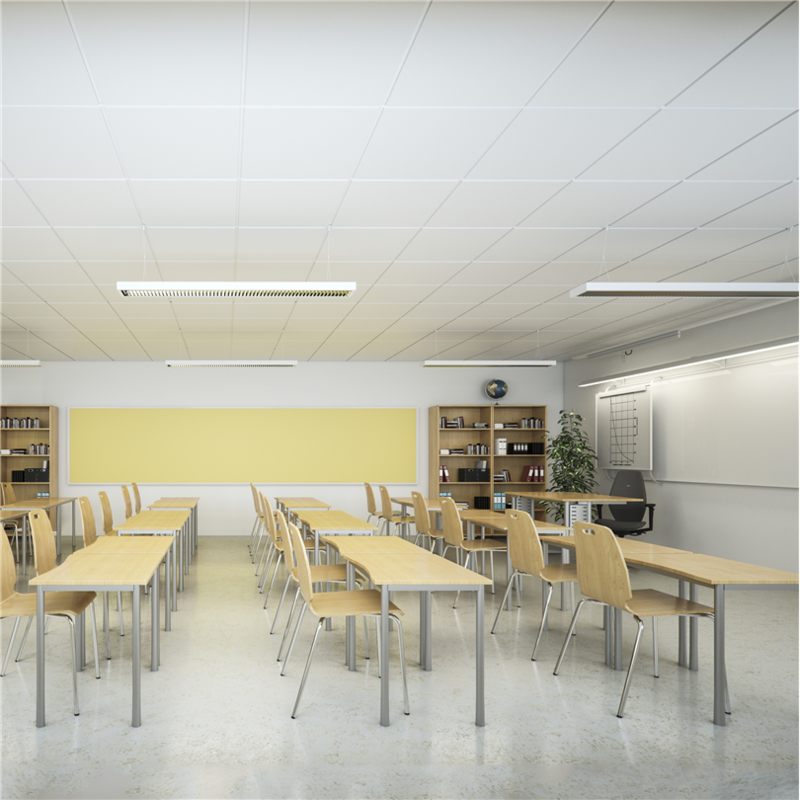 Ecophon Master Matrix is a patent pending acoustic ceiling system for larger areas where high coverage is required but a wall to wall solution not possible or wanted. The system provides quick and easy installation with highest accuracy, thanks to pre-installed fixing devices and "click-in" connection to the grid system. Each panel has a built in hatch function, and can easily be demounted. The system can either be installed with high coverage ratio, (approx. 95%), in modules of 1200 mm with a 40 mm gap between the panels giving a floating appearance (M344), or in rows of 1040 mm modules (M345), where the latter is mainly designed for TABS solutions giving a coverage ratio of approx. 60%, (at building module 1350 mm). Panels are available in different formats and sizes giving a vast range of design possibilities. 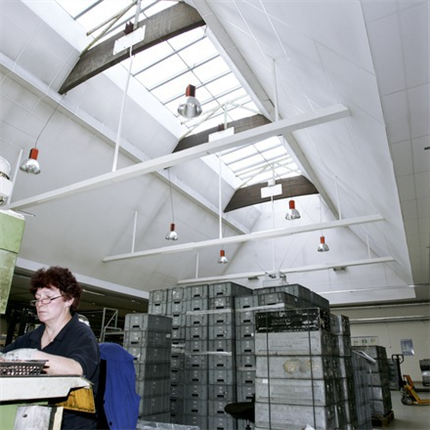 The system consists of Ecophon Master Matrix panels and Ecophon Connect grid system with an approximate weight of 5-6 kg/m². The panels are manufactured from high density 3rd generation glass wool. The visible surface of the panel has an Akutex FT coating and the back of the tile a glass tissue. Edges are straight cut and painted. The Connect grid and suspension system are manufactured from galvanized steel and aluminum. Ecophon Solo Baffles are acoustic solutions, primarily when it is not possible to install wall-to-wall ceilings. 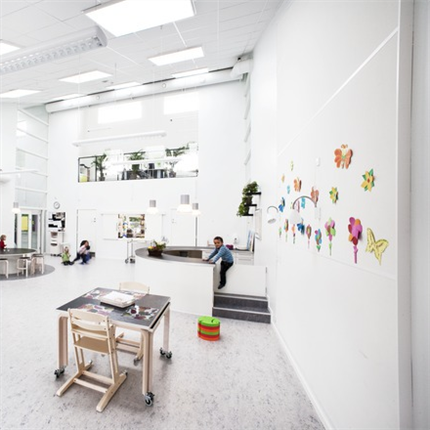 Baffles are suitable in buildings where the volume should be maintained, the natural light is brought into the room from skylights or as an option when TABS (Thermally Activted Building System) is selected as cooling system. Different possibilities exist to suspend the baffles using Connect Baffle profile, Connect Adjustable wire hanger or Connect grid system. The systems consist of Ecophon Solo Baffle/anchor or Solo Baffle/hook and Ecophon Connect accessories with an approximate weight of 2-3 kg/m. The baffles are manufactured fromhigh density, 3rd generation glass wool, with Akutex FT surface on both sides. The edges are straight cut and painted. Ecophon Solo Baffles are easily demountable systems. 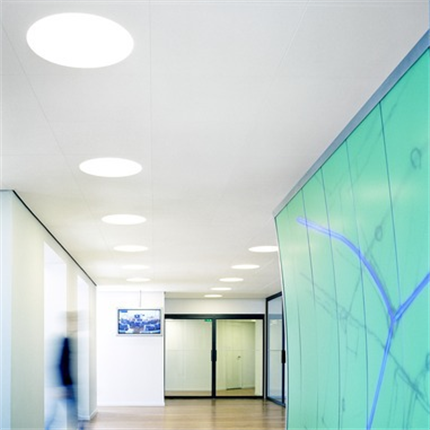 Ecophon Solo Circle is an acoustic solution, primarily when it is not possible to install a wall-to-wall ceiling. Solo Circle is suitable in buildings where the room volume could be maintained or as an option when TABS (Thermally Activated Building System) is selected as cooling system. Solo Circle is an unframed free hanging unit offering a high degree of design possibilities both regarding colours and suspension systems. The three different suspension systems using Adjustable wire hangers, One-point fixing or Adjust brackets in combination with the engineered Connect Absorber anchor (patent) give opportunities to create several layers and angles. The Ecophon Solo Circle tile is available in size Ø1200x40 mm with a weight of 4,5 kg or Ø800x40 mm with a weight of 2kg. The panel is manufactured from high density, 3rd generation glass wool, with Akutex™ FT surface on both sides. The edges are straight cut and painted. Ecophon Solo Circle XL is an acoustic solution, primarily when it is not possible to install a wall-to-wall ceiling. Solo Circle XL is suitable in buildings where the room volume could be maintained or as an option when TABS (Thermally Activated Building System) is selected as cooling system. Solo Circle XL is an unframed free hanging unit. The unit is suspended with Adjustable wire hangers which are attached to Connect Main runners. This, in combination with the engineered Connect Absorber anchor (patent pending) gives opportunities to create several layers. The Solo Circle XL panel consists of two semicircles. The complete panel is available in size Ø1600x40 mm with a weight of 8 kg. The panel is manufactured from high density, 3rd generation glass wool, with Akutex™ FT surface on both sides. The edges are straight cut and painted. 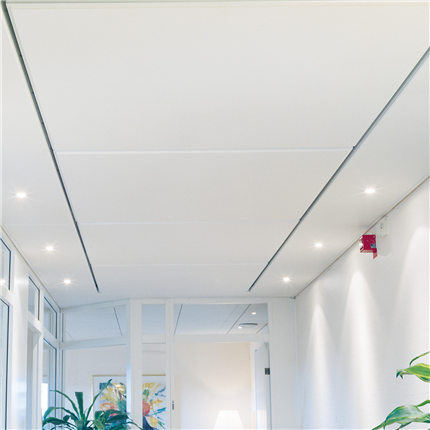 Ecophon Solo Rectangle is an acoustic solution, primarily when it is not possible to install a wall-to-wall ceiling. Solo Rectangle is suitable in buildings where the room volume could be maintained or as an option when TABS (Thermally Activated Building System) is selected as cooling system. Solo Rectangle is an unframed free hanging unit offering a high degree of design possibilities both regarding colours and suspension systems. The three different suspension systems using Adjustable wire hangers, One-point fixing or Adjust brackets in combination with the engineered Connect Absorber anchor (patent) give opportunities to create several layers and angles. The Solo Rectangle panel is available in sizes 2400x1200 and 1800x1200x40 mm with weights of 11,5 kg and 8.7 kg respectively. The panels are manufactured from high density, 3rd generation glass wool, with Akutex™ FT surface on both sides. The edges are straight cut and painted. For applications where the minimum possible overall depth of system is required. The tiles are bonded edge-to-edge directly to the soffit surface, creating a ceiling with a smooth appearance. The bevelled edges create a narrow groove between each tile. The tiles are not demountable. The tiles are manufactured from high density, 3rd generation glass wool. The visible surface has an Akutex™ FT coating and the back of the tile is covered with glass tissue. The edges are painted. The weight is approximately 2,5 kg/m². Ecophon recommend Connect Absorber Glue for a quick and easy installation. 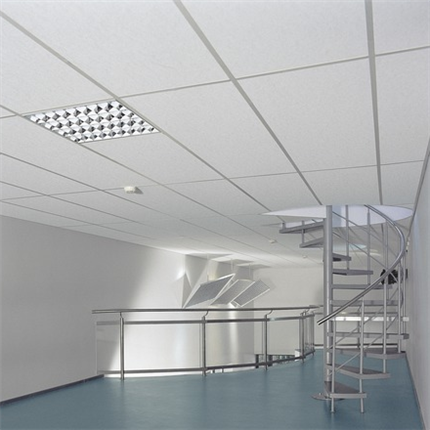 For applications requiring a ceiling which is mechanically secured to the structural soffit. Ecophon Focus F is installed directly to an existing plaster ceiling, boarding, battens or concrete, creating a ceiling with a smooth appearance. The bevelled edges create a narrow groove between each tile. The tiles are not demountable. The tiles are manufactured from high density, 3rd generation glass wool. The visible surface has an Akutex™ FT coating and the back of the tile is covered with glass tissue. The edges are reinforced and painted. The weight is approximately 2,5 kg/m². Ecophon recommend Connect screws for a quick and secure installation. For applications where the minimum possible overall depth of system is required because of limited space or other reasons. The tiles are bonded directly to the soffit surface. 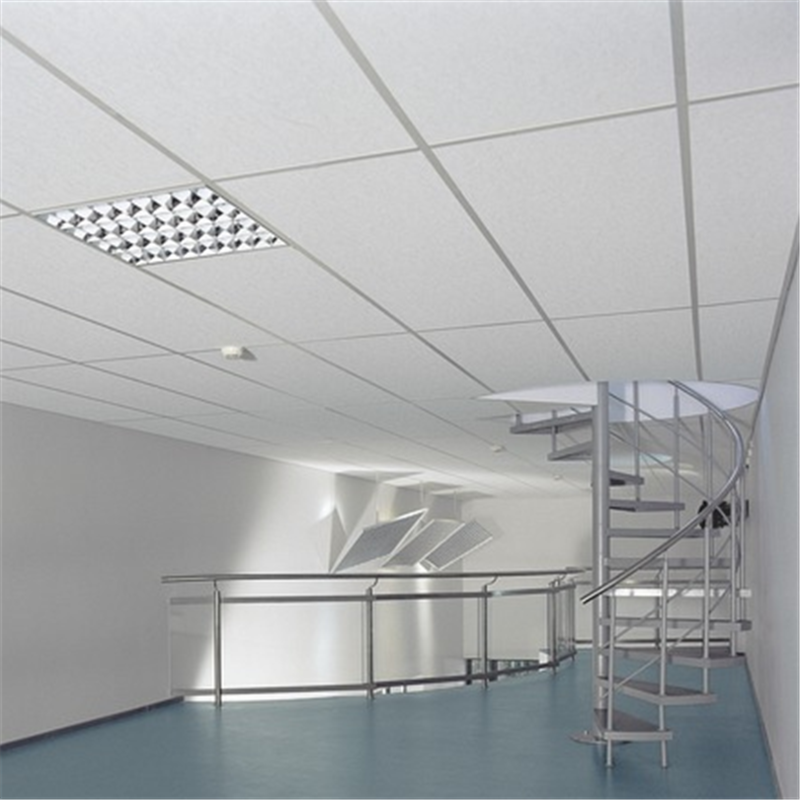 Ecophon Focus SQ is installed with a gap between each tile, creating a ceiling with a smooth appearance. The tiles are not demountable. The tiles are manufactured from high density glass wool. The visible surface has an Akutex FT coating and the back of the tile is covered with glass tissue. The edges are painted. The weight is approximately 2,5 kg/m². Ecophon recommends Connect Absorber Glue for a quick and easy installation. 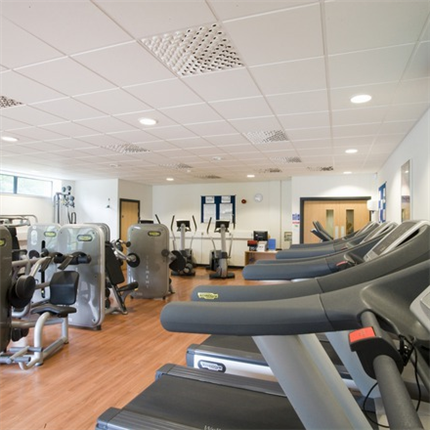 For applications where a standard suspended ceiling system is required, but where strict functional requirements are needed. Ecophon Gedina A has an exposed grid. Each tile is easily demountable. Note that installation according to installation diagram M118 contributes to a higer live load capacity compared to M237. The system consists of Ecophon Gedina A tiles and Ecophon Connect grid systems, with an approximate weight of 2,5 kg/m². The tiles are manufactured from high density, 3rd generation glass wool. The visible surface has an Akutex™ T coating and the back of the tile is covered with glass tissue. Ecophon Gedina A can be supplied with primed edges or natural edges. The grid is manufactured from galvanized steel. For best performance and system quality, use Ecophon Connect grid and accessories. 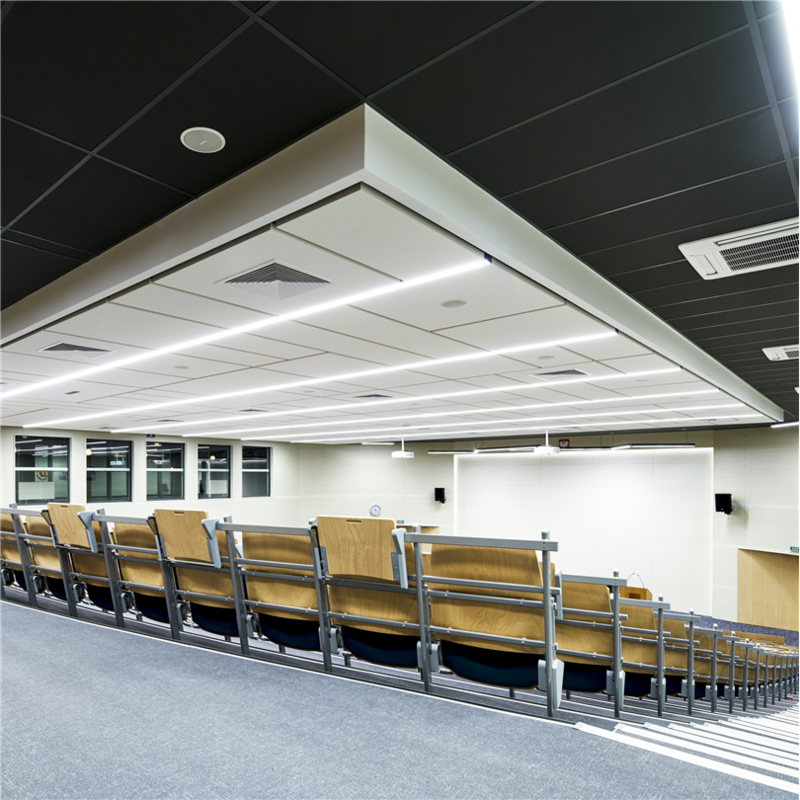 For applications requiring a standard ceiling which is easy to install and demount, but where strict functional requirements are needed. 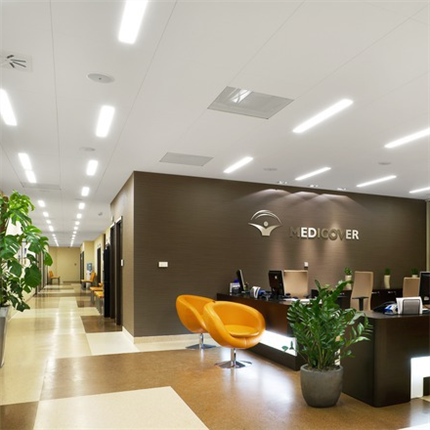 Ecophon Gedina E has a recessed visible grid and a tegular edge design, creating a ceiling with a shadow effect that accentuates each tile and partially conceals the grid system. The visible surface of each tile is 7 mm below the grid. Each tile is easily demountable. Note that installation according to installation diagram M121 contributes to a higher live load capacity compared to M270. The system consists of Ecophon Gedina E tiles and Ecophon Connect grid systems, with an approximate weight of 2,5 kg/m². The tiles are manufactured from high density, 3rd generation glass wool. The visible surface has an Akutex™ T coating and the back of the tile is covered with glass tissue. The edges are painted. 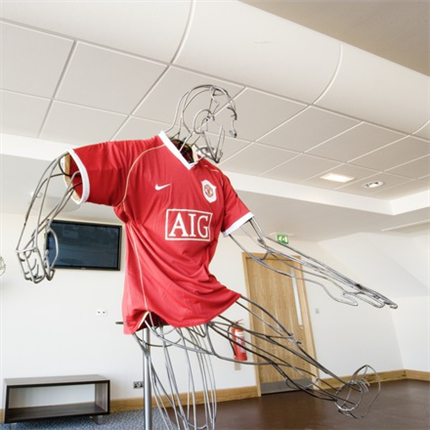 The grid is manufactured from galvanized steel. For best performance and system quality, use Ecophon Connect grid and accessories. 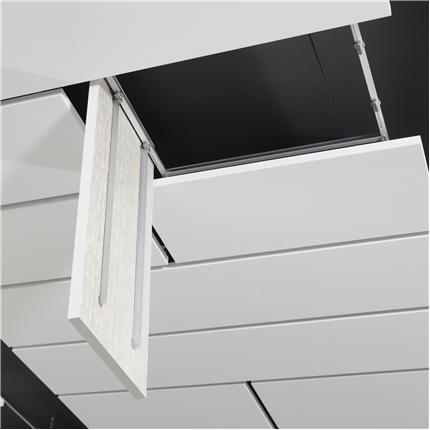 For applications requiring an easily installed suspended ceiling meeting the essential functional demands. 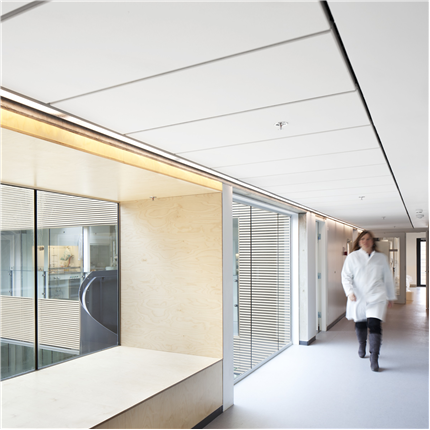 Ecophon Advantage A has an exposed grid system and each tile is individually demountable for easy access to soffit above. The system consists of Ecophon Advantage A tiles and Ecophon Connect grid system with an approximate weight of 2,5 kg/m². The tiles are manufactured from high density, 3rd generation glass wool. The visible surface is a high quality batch painted glass tissue in white colour and the back of the tile is covered with glass tissue. Available with natural edges or with edges primed. For best performance and system quality use Ecophon Connect grid and accessories. The Connect grid is manufactured from galvanized steel. For applications requiring an easily installed suspended ceiling meeting the essential functional demands. 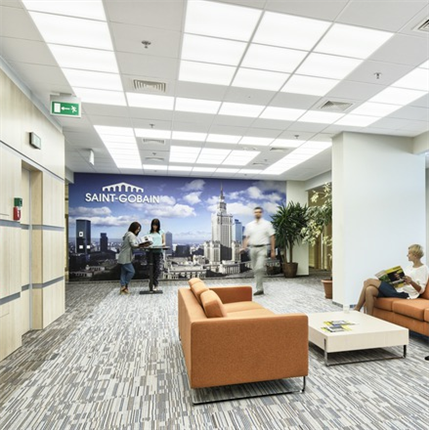 Ecophon Advantage E has an recessed visible grid and a tegular edge design creating a ceiling with a shadow effect that accentuates each tile and partially conceals the grid system. The visible surface of each tile is 7 mm below the grid. Each tile is individually demountable for easy access to soffit above. The system consists of Ecophon Advantage E tiles and Ecophon Connect grid system with an approximate weight of 2,5 kgs/m². The tiles are manufactured from high density, 3rd generation glass wool. The visible surface is a high quality batch painted glass tissue in white colour and the back of the tile is covered with glass tissue. The edges are painted. For best performance and system quality use Ecophon Connect grid and accessories. The Connect grid is manufactured from galvanized steel. For applications where the minimum possible overall depth of system is required and where strict demands are made on good acoustics and speech intelligibility. The tiles are bonded edge-to-edge directly to the soffit surface, creating a ceiling with a smooth appearance. The bevelled edges create a narrow groove between each tile. The tiles are not demountable. The tiles are manufactured from high density, 3rd generation glass wool. The visible surface has an Akutex™ FT coating and the back of the tile is covered with glass tissue. The edges are painted. The weight is approximately 5 kg/m². Ecophon recommend Connect Absorber Glue for a quick and easy installation. Suitable for schools, open plan offices or other premises where strict demands are made on good acoustics and speech intelligibility. Ecophon Master F is installed directly to an existing plaster ceiling, boarding, battens or concrete, creating a ceiling with a smooth appearance. The bevelled edges create a narrow groove between each tile. The tiles are not demountable. The tiles are manufactured from high density, 3rd generation glass wool. The visible surface has an Akutex™ FT coating and the back of the tile is covered with glass tissue. The edges are reinforced and painted. The weight is approximately 5 kg/m². Ecophon recommend Connect screws for a quick and secure installation. 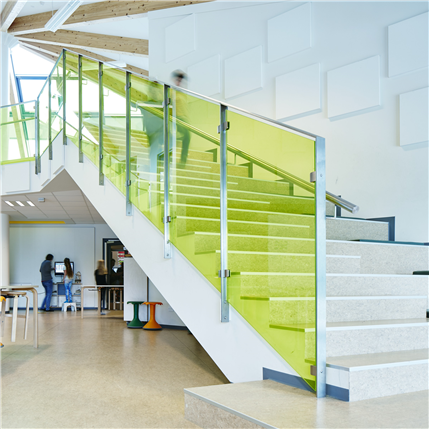 Suitable for schools, open plan offices or other premises where strict demands are made on good acoustics and speech intelligibility. The tiles are bonded directly to the soffit surface. Ecophon Master SQ is installed with a gap between each tile, creating a ceiling with a smooth appearance. The tiles are not demountable. The tiles are manufactured from high density, 3rd generation glass wool. The visible surface has an Akutex™ FT coating and the back of the tile is covered with glass tissue. The edges are painted. The weight is approximately 5 kg/m². Ecophon recommend Connect Absorber Glue for a quick and easy installation. 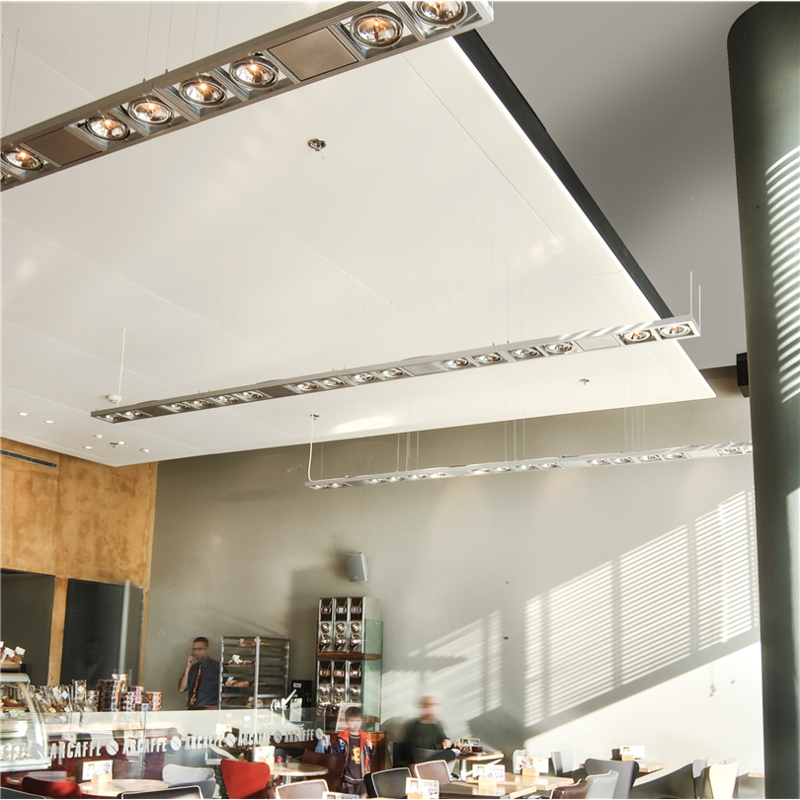 Ecophon Solo Square is an acoustic solution, primarily when it is not possible to install a wall-to-wall ceiling. Solo Square is suitable in buildings where the room volume could be maintained or as an option when TABS (Thermally Activated Building System) is selected as cooling system. Solo Square is an unframed free hanging unit offering a high degree of design possibilities both regarding colours and suspension systems. The three different suspension systems using Adjustable wire hangers, One-point fixing or Adjust brackets in combination with the engineered Connect Absorber anchor (patent) give opportunities to create several layers and angles. The Solo Square panel is available in size 1200x1200x40 mm with a weight of 6 kg. The panel is manufactured from high density, 3rd generation glass wool, with Akutex™ FT surface on both sides. The edges are straight cut and painted. 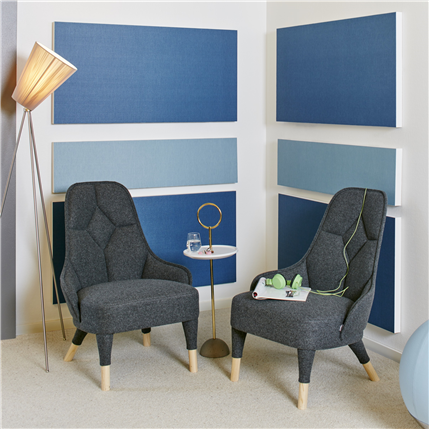 For use as wall absorbers together with a sound absorbing ceiling, to achieve excellent acoustic properties in the room. Ecophon Akusto™ Wall A has an exposed profile system. The system consists of Ecophon Akusto™ Wall A panels and Ecophon Connect profile systems, with an approximate weight of 4 kg/m². The panels are manufactured from high density, 3rd generation glass wool. The visible surface has a glass fibre fabric (Texona) or an impact resistant glass fibre fabric (Super G), and is also available with a painted surface (Akutex™ FT). The back of the panel is covered with glass tissue. The edges are natural. For best performance and system quality, use Ecophon Connect grid and accessories. 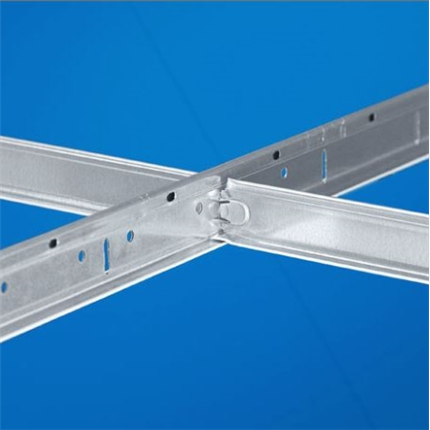 The profiles are manufactured from galvanized steel (Connect Channel trim) or aluminum (Connect Thinline). For use as wall absorbers together with a sound absorbing ceiling, to achieve excellent acoustic properties in the room. Ecophon Akusto™ Wall C has a concealed grid and the bevelled edges create a narrow groove between each panel. The system provides extensive design possibilities. The system consists of Ecophon Akusto™ Wall C panels and Ecophon Connect profile systems with an approximate weight of 5 kg/m². The panels are manufactured from high density, 3rd generation glass wool. The visible surface has a glass fibre fabric (Texona) or an impact resistant glass fibre fabric (Super G), and is also available with a painted surface (Akutex™ FT). The back of the panel is covered with glass tissue. The edges are painted, and the front surface is partly covering the long edges. The Texona gamma version offers a reflecting surface, see absorption diagram. For best performance and system quality, use Ecophon Connect profiles and accessories, which gives a lot of design possibilities. The profiles are manufactured from extruded aluminium. 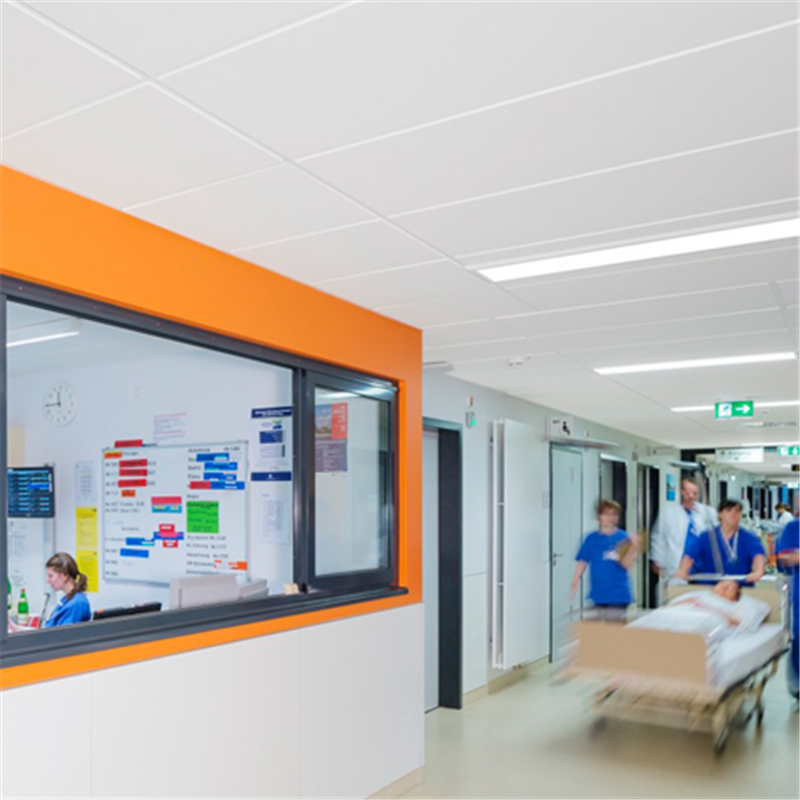 Ecophon Hygiene Protec A is a wall to wall, sound-absorbing ceiling system intended for environments where there are demands on low particle emission and where occasional wet wiping and/or disinfection is required. Examples of applications: theatre suites in health care premises, the pharmaceutical and electronics industries. The system is classified B1,B5 and B10 for zone 4 according to standard NF S 90-351 and clean room classified according ISO 5. The system consists of Ecophon Hygiene Protec A tiles, which have a core of high density, 3rd generation glass wool and a painted particle-repellent Akutex™ HP surface. The rear side and the edges are painted. The supporting structure is an exposed Connect T24 grid of galvanised steel. The weight of the system is 3-4 kg/m2. The tiles should be secured to the grid with Connect Hygiene clips in order to withstand pressure during cleaning and to minimise dirt traps. 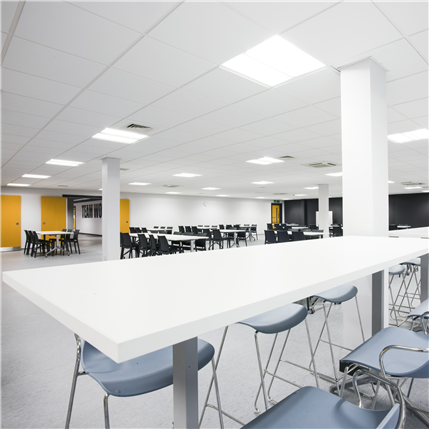 For applications requiring a dark ceiling having low light reflection and a concealed grid, but where individual tiles must be demountable. Ecophon Sombra Ds is installed in a suspended grid system, creating a ceiling with a smooth appearance. The bevelled edges create a narrow groove between each tile. The tiles are easily demountable. The system consists of Ecophon Sombra Ds tiles and Ecophon Connect grid systems, with an approximate weight of 4 kg/m² (5 kg/m² with Ecophon Extra Bass). The tiles are manufactured from high density, 3rd generation glass wool. The visible surface is a matt black batch painted glass tissue and the back of the tile is covered with glass tissue. The edges are painted. 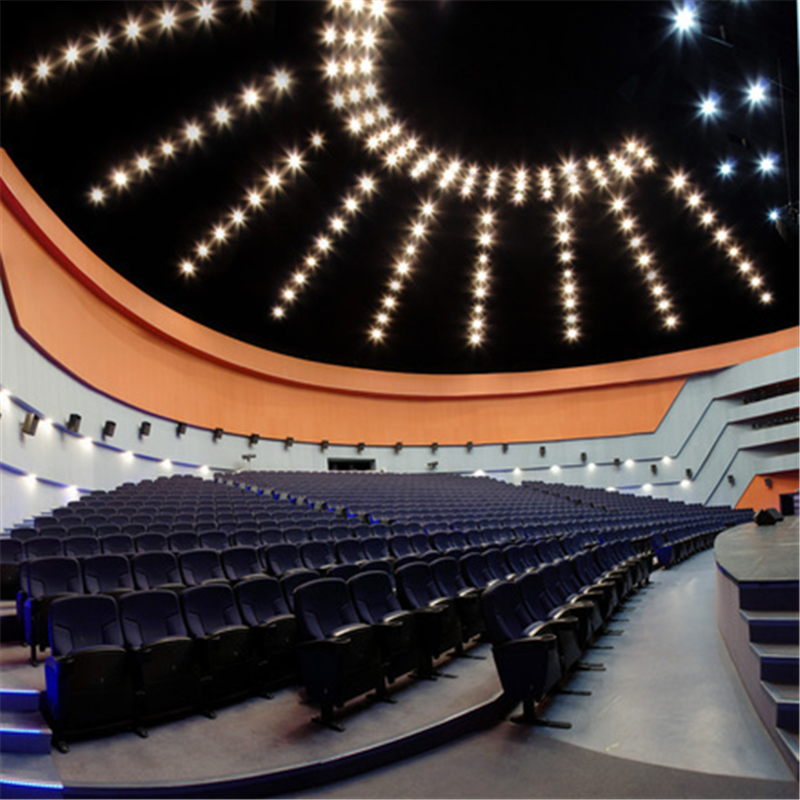 To improve absorption in the low frequency range, Ecophon Extra Bass can be installed on top of the suspended ceiling. For best performance and system quality, use Ecophon Connect grid and accessories. The grid is manufactured from galvanized steel. 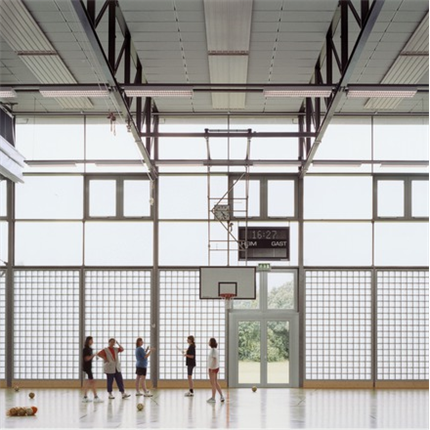 For ceilings in school corridors and other environments where there is some risk of mechanical impact. Ecophon Super G A has an exposed grid system, with impact bracing bars or clips keeping the tiles in place. The tiles are non-demountable. The systems consist of Ecophon Super G A tiles and Ecophon Connect grid systems, with an approximate weight of 3-4 kg/m². The tiles are manufactured from high density, 3rd generation glass wool. The visible surface has a strong glass fibre fabric and the back of the tile is covered with glass tissue. The edges are primed or natural. For best performance and system quality, use Ecophon Connect grid and accessories. The grid is manufactured from galvanized steel. For applications where the minimum possible overall depth of system is required and where there is risk of high mechanical impact. The tiles are bonded edge-to-edge directly to the soffit surface, creating a ceiling with a smooth appearance. The bevelled edges create a narrow groove between each tile. The tiles are not demountable. The tiles are manufactured from high density glass wool utilizing the 3RD Technology. The visible surface is a strong glass fibre fabric and the back of the tile is covered with glass tissue. The edges are painted. The weight is approximately 5 kg/m². Ecophon recommend Connect Absorber Glue for a quick and easy installation. For use as a suspended ceiling with high sound absorption and for sound insulation between rooms if the partitions do not extend all the way up to the soffit. Also suitable for sound reduction of vertical noise, generated by ventilation, foot steps etc. Ecophon Combison Duo A has an exposed grid system. Each tile is demountable. The system consists of Ecophon Combison Duo A tiles and Ecophon Connect grid systems, with an approximate weight of 14 kg/m². The tiles are manufactured from high density, 3rd generation glass wool, with a bonded gypsum board (13 mm) on the back of the tile. The visible surface has an Akutex™ FT coating and the edges are primed. The grid is manufactured from galvanized steel. 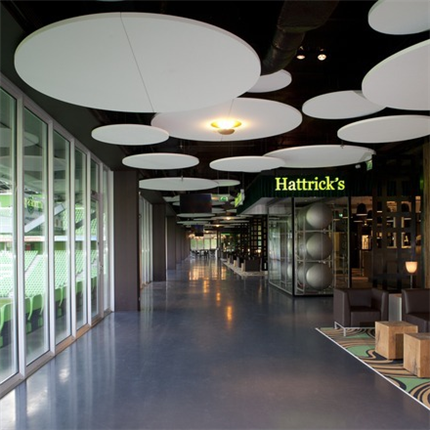 For use as a suspended ceiling with high sound absorption and for sound insulation between rooms if the partitions do not extend all the way up to the soffit. Also suitable for sound reduction of vertical noise, generated by ventilation, foot steps etc. Ecophon Combison Duo E has a recessed visible grid and a tegular edge design, creating a ceiling with a shadow effect that accentuates each tile and partially conceals the grid system. The visible surface of each tile is approx. 10 mm below the grid. Each tile is demountable. The system consists of Ecophon Combison Duo E tiles and Ecophon Connect grid systems, with an approximate weight of 14 kg/m². The tiles are manufactured from high density, 3rd generation glass wool, with a bonded gypsum board (13 mm) on the back of the tile. The visible surface has an Akutex™ FT coating and the edges are painted. For best performance and system quality, use Ecophon Connect grid and accessories. The grid is manufactured from galvanized steel. For use as a sound absorbing ceiling and for sound insulation between rooms if the partitions do not extend all the way up to the soffit. Also suitable for sound reduction of vertical noise, generated by ventilation, foot steps etc. Ecophon Combison Uno A has an exposed grid system. Each tile is demountable. The system consists of Ecophon Combison Uno A tiles and Ecophon Connect grid systems, with an approximate weight of 13 kg/m². The tiles are manufactured from high density, 3rd generation glass wool, with a bonded gypsum board (13 mm) on the back of the tile. The visible surface has an Akutex™ FT coating and the edges are primed. For best performance and system quality, use Ecophon Connect grid and accessories. The grid is manufactured from galvanized steel. For use as a sound absorbing ceiling and for sound insulation between rooms if the partitions do not extend all the way up to the soffit. Also suitable for sound reduction of vertical noise, generated by ventilation, foot steps etc. 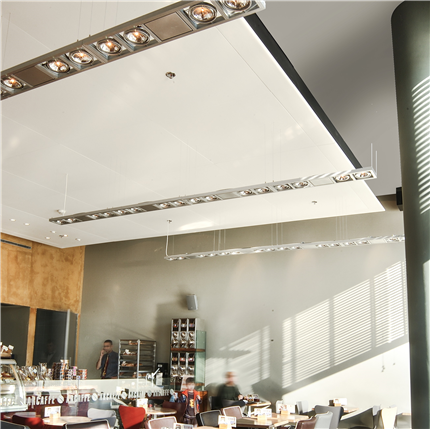 Ecophon Combison Uno Ds is installed in a suspended grid system, creating a ceiling with a smooth appearance. The bevelled edges create a narrow groove between each tile. The tiles are demountable. The system consists of Ecophon Combison Uno Ds tiles and Ecophon Connect grid systems, with an approximate weight of 11 kg/m². The tiles are manufactured from high density, 3rd generation glass wool, with a bonded gypsum board (9 mm) on the back of the tile. The visible surface has an Akutex™ FT coating and the edges are primed. For best performance and system quality, use Ecophon Connect grid and accessories. The grid is manufactured from galvanized steel. The system is patended. A function ceiling suitable for noise reduction in industry premises, where different sizes and installation methods are required. Ecophon Industry Modus can be installed in exposed grid systems or with screw and washer. The system consists of Ecophon Industry Modus tiles and Ecophon Connect grid systems, with an approximate weight of 3-5 kg/m² depending on thickness. The tiles are manufactured from high density 3rd generation glass wool. The visible surface is a batch painted glass tissue (S) and the back of the tile is covered with glass tissue. The edges are natural. For best performance and system quality, use Ecophon Connect grid and accessories. The grid is manufactured from galvanized steel. (Ecophon Industry Modus is a function ceiling system any smaller aesthetical deviations between the tiles may occur. These deviations do not have any impact on the functionality of the system). 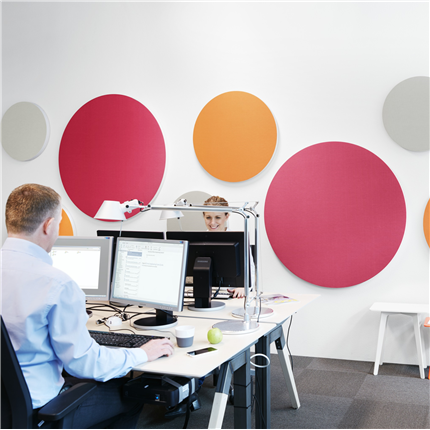 Ecophon Akusto Screen A is a highly efficient sound absorbing screen which together with a sound absorbing ceiling gives excellent room acoustics in open areas like open-plan offices. Akusto Screen is a vital part of an acoustic solution for TABS (Thermally Activated Building Systems) buildings. It has the same Texona surface as Akusto Wall™ which will keep your colour design consistent. Ecophon Akusto Screen A has a high density absorber in 3rd generation glass wool and has excellent sound-reducing properties. It is set in a naturally anodised aluminum frame and both sides have a glass fibre fabric surface (Texona). The approximate weight is 24-44 kg. It is also possible to get a 6 mm thick and 400 mm high clear glass pane on top of the screen, total height of screen 1820 mm. The feet are naturally anodised aluminum. Ecophon Hygiene Foodtec Baffle C3 is an open system with vertical baffles intended for use in environment where there is risk of contamination, and where frequent cleaning is required. This system is recommended where humidity levels are occasionally high. It is used mainly in premises where it is not possible to install a wall to wall ceiling because of sprinkler systems, installations or skylights, etc. Examples of applications: the food and beverage industries, restaurants and catering. The system consists of Ecophon Hygiene Foodtec Baffles, which have a core of high density, 3rd generation glass wool and a painted stain protected Akutex HS surface both sides. The edges are painted. The supporting structure is a corrosion protected exposed Connect T24 C3 grid of specially treated steel with a high corrosion resistance. The weight of the system is approximately 5 kg/m2. To increase the sound absorption in the room this system gives you the possibility to install Ecophon Akusto One SQ on the wall. The systems give design possibilities, working with different formats and colours to create various patterns. There are three fixings for Akusto One SQ, Connect™ One trim, Connect™ One hook fixing or Connect™ One fixing. Akusto One SQ is available in various sizes with a weight of 2,0-4,5 kg. The panel is manufactured from high density, 3rd generation glass wool. The visible surface has a glass fibre fabric Texona in colours and is also available with a painted surface (Akutex™ FT). The back of the panel is covered with glass tissue. The edges are straight cut and painted in white or grey. Ecophon Hygiene Meditec A C1 is a wall to wall, sound-absorbing ceiling system intended for environments where disinfection and/or cleaning is required on a regular basis. This system is recommended for dry environments. Examples of applications: consulting rooms in healthcare premises. The system is classified B1 and B5 for zone 4 according to standard NF S 90-351 and clean room classified according ISO 5. 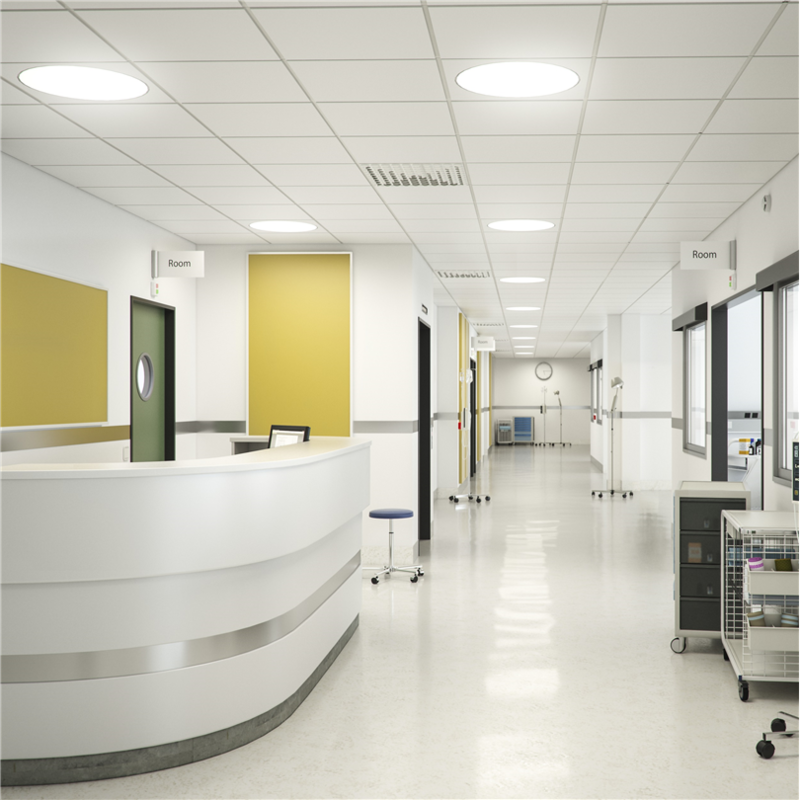 Ecophon Hygiene Meditec E C1 is a wall to wall, sound-absorbing ceiling system intended for environments where disinfection and/or cleaning is required on a regular basis. This system is recommended for dry environments. It has a recessed visible grid and a tegular edge design, creating a ceiling with a shadow effect that accentuates each tile and partially conceals the grid system. The visible surface of each tile is 7 mm below the grid. Examples of applications: consulting rooms in healthcare premises. The system is classified B1 and B5 for zone 4 according to standard NF S 90-351 and clean room classified according ISO 5. 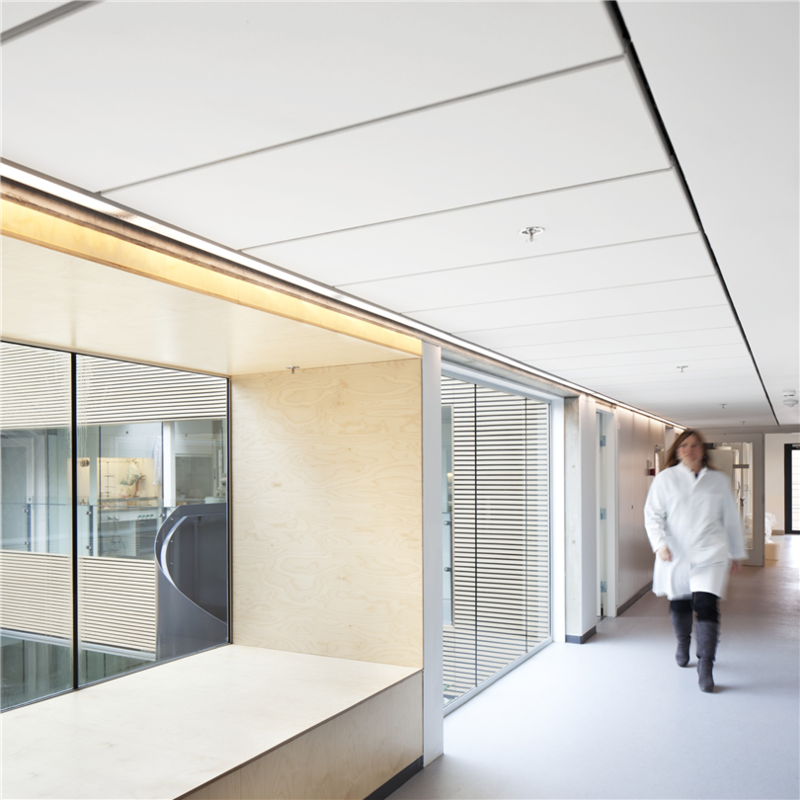 Ecophon Hygiene Performance A C1 is a wall to wall, sound-absorbing ceiling system intended for environments where there is a risk for slight contamination, and where cleaning is required on a regular basis. This system is recommended in dry environments. Examples of applications: canteens, locker rooms and toilets. The system is classified B1 and B5 for zone 4 according to standard NF S 90-351 and clean room classified according ISO 5. The system consists of Ecophon Hygiene Performance A tiles, which have a core of high density glass utilizing the 3RD Technology wool and a painted cleanable Akutex TH surface. The back of the tile is covered with glass tissue. The edges are primed. The supporting structure is an exposed Connect T24 grid of galvanised steel. The weight of the system is 3-4 kg/m²(20 mm) and 5 kg/m²(40 mm). The tiles should be secured to the grid with Connect Hygiene clips in order to withstand pressure during cleaning and to minimise dirt traps. 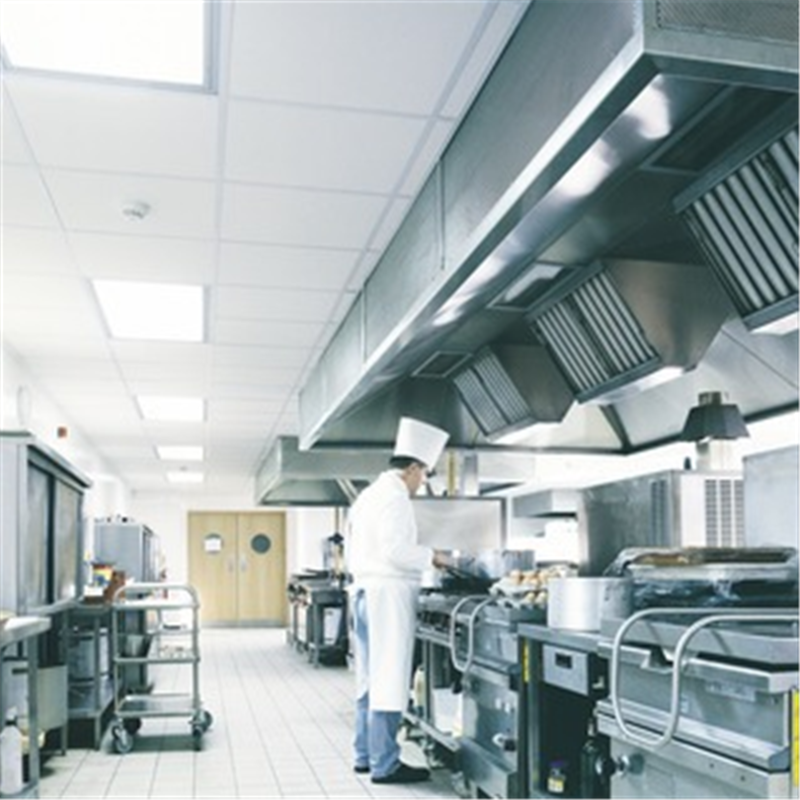 Ecophon Hygiene Advance A C3 system is a wall to wall, sound-absorbing ceiling system intended for use in environments where there is a high level of contamination, and where frequent cleaning is required. The system is also an excellent choice for clean environments with high demands on low particle emissions. Examples of applications: in healthcare premises like operation theatres and laboratories with very high requirements on particle emission and disinfection, in food and beverage industries in areas exposed to splatter from different kinds of liquids that require daily cleaning. In kitchens in dishwashing areas with constantly high humidity. The system is classified B1 and B5 for zone 4 according to standard NF S 90-351 and clean room classified according ISO 3. The system consists of Ecophon Hygiene Advance A tiles, which have a core of high density, 3rd generation glass wool encapsulated in a smooth high-performance film that is impervious to particles and water. The film is also dirt-repellent and resistant to most chemicals. The supporting structure is a corrosion protected exposed Connect T24 C3 grid ofspecially treated steel with a high corrosion resistance. The weight of the system is approximately 3 kg/m2 (20 mm) and 4,5 kg/m2 (40 mm). The Ecophon Hygiene Advance A C3 is a technical ceiling system which might have aesthetic variations that will not affect the functionality of the system. For applications where a robust suspended ceiling system is required. Ecophon Focus A has an exposed grid system. Each tile is easily demountable. The systems consist of Ecophon Focus A tiles and Ecophon Connect grid systems, with an approximate weight of 3 kg/m². The tiles are manufactured from high density glass wool utilizing the 3RD Technology. The visible surface has an Akutex™ FT coating and the back of the tile is covered with glass tissue. The edges are primed. The grid is manufactured from galvanized steel. Våra sinnen är anpassade för ljud- och ljusmiljön utomhus. Vi både mår och arbetar bäst i en ljud- och ljusmiljö som liknar naturens.